The CycleOps Mag Indoor Bicycle Trainer is designed to enable cyclists to train during inclement weather and winter months. The CycleOps Mag is unique because of it’s use of magnetic fields which create resistance that can be supplemented by the gears of an attached bicycle. It debuted in 2002 as the first of it’s kind when Saris Cycling Group released the CycleOps Magneto. The trainer features a solid steel frame that provides strong support while the wide legs provide stability. Resistance can be adjusted via a lever located on the back wheel, and it includes a flywheel that’s supposed to keep the mechanical noise down during training. Currently the CycleOps Mag is priced at $170 new and $140 used on Amazon. CycleOps Mag is a fair price for what you get. 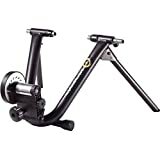 Compared to magnetic bike trainers of similar quality on the market, which can range from $200 to over $300, the $170 price for a new trainer is very reasonable, and the brand CycleOps itself is well known and trusted. Users enjoy the convenience of an at-home indoor cycling experience, especially if they are busy with children or work. The trainer is easy to set up and includes an informational DVD. The user can be confident that the strong, well balanced frame will support your weight without tipping over or speeding into a wall. The resistance it provides when paired with geared bikes serves the purpose of challenging the user and maintaining strength and endurance in the off-season. The foot pads on the legs are adjustable, eliminating the headache of uneven surfaces. The trainer easily folds up when not in use, and is quick to set up again. Despite it’s solid steel frame, CycleOps Mag is easy to lift and transport. New purchases come with a Lifetime Manufacturer’s Warranty, which covers any potential defects or replacement parts. There is even a Warranty Hotline number provided. Users consistently report fast and reliable customer service. The most common complaint is that the bike trainer can be a bit noisy at high RPM. This is mostly a problem for users living in apartments or housing with thin walls. Otherwise the noise level is about equal or less than a treadmill, and can be lessened by using a smooth back wheel instead of a typical mountain bike tread. The noise is still soft enough to be able to watch tv or listen to music as you ride. The CycleOps Mag might not fit all bikes. It is meant to be used with a provided skewer, which replaces the skewer on your bicycle. Failing to use the provided skewer might put your bike at risk of damage, and some bike owners complain of the time it takes to make the switch. When a bike is properly attached to the CycleOps Mag Trainer, the bike is at a slight tilt facing downwards. It may be recommended to purchase a cycling block if you prefer to cycle at a more horizontal position. Unless your walls are paper-thin and you’re really shy of your neighbors, any noise that the CycleOps Mag might make is tolerable. TV, movies, and music can still be heard, and the issue of noise can be lessened by using a smoother back wheel. The CycleOps Mag Indoor Bike Trainer achieves what it’s designed to do. It’s a safe piece of equipment that will challenge your body as you train in the off-season or all year round. CycleOps is a good brand, at a reasonable price. 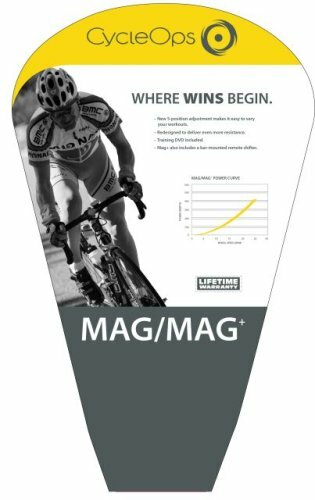 If you have the money to buy a higher end trainer, like the Mag+, Magneto, or SuperMagneto Pro, you’ll get more features, but if you’re limited in your budget and happy with a trainer that works and can be relied upon, stick with the CycleOps Mag.